Amazon is going low-tech and a bit retro with its Treasure Truck, the online retailers’ version of deals on wheels, that is now coming to a Whole Foods parking lot near you. The first Treasure Truck deal was the hot-selling Instant Pot, according to the Tech Crunch website. 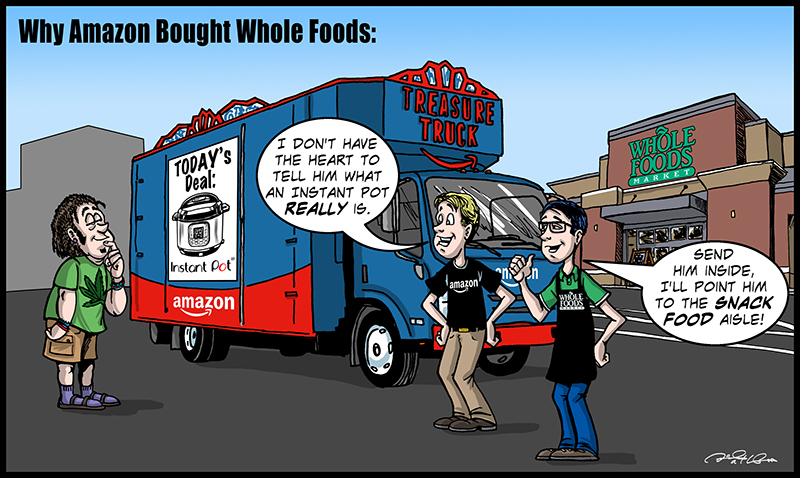 The reason why Whole Food shoppers should be glad to see the truck is not just because they can get the special deal cheaper, they’ll also get money-off coupons to spend inside the store, plus as in the case of the Instant Pot special, recipes from Nom Nom Paleo author Michelle Tam. The Treasure Truck program began testing back in 2015 in Seattle, Tech Crunch reported. Last summer, it expanded across the U.S., and by the end of 2017, it hit the U.K. Shoppers also can score the Treasure Truck deals through their Amazon app, pay for the items while online and then, rather than wait to have the items ship, show up in person to claim their item. It’s the tangible version of the deal site Amazon purchased in 2010, Woot! Woot!’s tagline, by the way, is “Sappy Deals & Shenanigans.” Perhaps the Treasure Truck is meant to turn those sappy deals into snappy deals — like offering an Instant Pot, which is like the old-fashioned slow-cooker only fast.